Motorcycles are an especially-popular choice of transportation during the summer months. Warmer weather is a good time to enjoy your bike, but it is imperative that you take the proper precautions to ensure your safety. If you are not a biker yourself, always be aware and double-check for them to prevent severe accidents. Unfortunately motorcycles kill thousands of people each year. The Department of Transport has just released its latest findings regarding motorcycle safety. The most-recently reported data is for 2011, showing that 4,323 motorcyclists died in the U.S. during that year. Unfortunately, this is a 2% increase from 2010. Additionally, 289 people were killed on other bikes such as three wheelers and mopeds. A total of 49% of all fatal motorcycle crashes were due to the bike crashing with another vehicle. 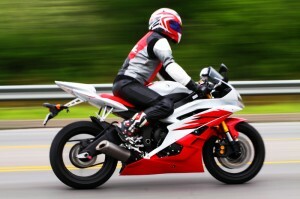 6% of 2011 motorcycle deaths were a result of someone hitting the bike from behind. Always wear protective gear. Long-sleeved shirts, jackets and pants made of leather are a good choice that will help prevent serious road rash if you are in an accident. A helmet with eye protection will greatly increase your chances of surviving a crash and avoiding serious injury. Riding with a one will also help prevent serious brain injury in the event of an accident. The majority of states have partial or universal laws regarding helmet protection. Never weave between lanes. Quickly switching lanes while speeding makes it nearly impossible for another car to see a motorcyclist, which could result in a very serious crash. Make sure it is a DOT-approved helmet. Know your motorcycle. Understand that not all motorcycles are alike so controls, gears and braking can vary. Double check before switching lanes. Do not rely on mirrors when moving over, as motorcycles can appear seemingly out of nowhere. The same rule applies to turning and pulling into traffic. Follow cyclists at a distance. Allow enough room to stop in the event the cyclist in front of you suddenly brakes for potholes, debris or other cars. Share the road. Bikers should always have a full lane and plenty of space to ride. Note that cyclists often slow down by rolling off the throttle or downshifting. Doing so does not activate a brake light. The Motorcycle Safety Foundation website is a good resource for finding training courses and refreshing your memory on motorcycle safety. Being a defensive driver could save your’s or someone else’s life.